A Setback- Planter Fasciitis | I Can Run, So I Will! A little before my first race I had a setback- Planter Fasciitis. Planter Fasciitis is a painful inflammation of the connective tissue on the bottom of the foot. Mine was/is located along the arch, though some will also feel it in the heel. I have only had it once before while hiking, so bad that I bailed on the group I was hiking with. It is quite often the biggest ‘injury’ fear to a runner. At first I was crushed reading pages about how it can take 6 months to heal and the #1 recommendation is to stop running for a period of time. I decided to do everything I could to heal it and take things day by day. I stopped running, stretched my foot and calf through out the day and rolled my foot on ice at least twice a day. I have not had the pain return since it has healed! Don’t ignore the first signs of pain! The sooner you put time into healing, the less time it will take! Stop running and any other activity that can further irritate your foot. Basically, take it easy. Which is not an easy thing for a runner with an upcoming run on their calendar. An alternative? Try swimming or biking for cardio in the meantime. Who knows- maybe that will give some inspiration to do a triathlon! Ice your foot minimally 2 times a day. Best thing to do is to take a disposable cups and fill them halfway with water and freeze. 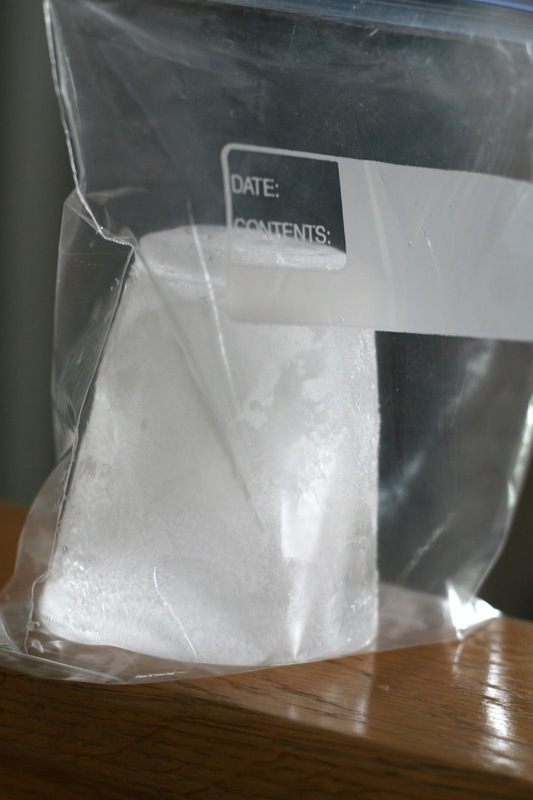 Run the frozen cup under warm/hot water for half a minute or until it easily comes out and place into a ziplock bag. Try to get the air out as best as possible. 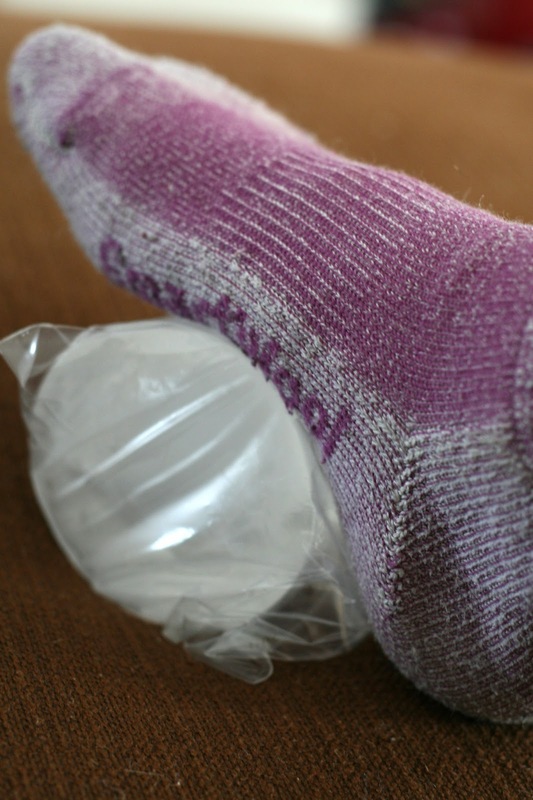 Roll the ice on the arch of your foot for at least 15 minutes. I always wear wool socks and that kept a perfect barrier from the ice so I didn’t hurt my foot with it being too cold. If you dont have wool socks you can add more layer of socks until your foot is chilled but not in any pain from the cold. I kept 3 cups on rotation in the freezer; took one out, put one in and if I didn’t get around to replacing it, I had two backups! Stretching! Every morning (when the pain is the worst!) and though out the day I would stretch not only my foot, but also focus on my calf. Best time to stretch is with warm muscles- try after a shower or after a short warm-up run- sometime after your first half – mile of running. Once you feel your foot is ready for a run- take it slow! It wont hurt while you run but you will know the next morning if the pain is still there. Continue to make sure you stretch to PREVENT Planter Fasciitis from coming back. Chances are if you have had fascia pain in the past you are more likely to have it return. Don’t increase mileage too fast. I often read to only increase 10% at a time. Make sure you are fitted for the correct shoe and support. Your local running shop should have a professional that will fit you properly. ← My Little Running Buddy!